Puglia, the heel of Italy’s boot, is a sun-baked region that has a rich culture of simple pleasures. It’s a favoured getaway within Italy, and so gets packed out in the summer months, with Italian families filling their cars and hot-footing it here for the back-in-time hilltop and coastal towns, long sandy beaches, space to roam, and beautiful coastline, as well as the delicious rustic cuisine. Although busy in summer, the region also bursts with life and energy in July and August, with celebrations and food festivals every night. Whether during the school summer holidays or, with younger children during the long shoulder season (you’ll find weather in the mid-20s or above from mid-May through to early October), Puglia is the perfect place for a seaside family holiday. Puglia is surrounded by powder-blue sea lapping pale cream silky sand. Outstanding beaches include the sublime 4km stretch of Torre Lapillo, an arc between two 16th-century watchtowers – the shallow tilt of the bay is ideal for families with young children. 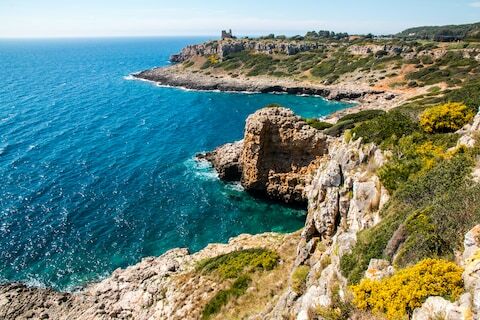 At the southernmost stiletto point of Italy’s heel is Pescoluse, known as the Maldives of Puglia, and there are some lovely beaches around Otranto, including the wild, pine tree-backed Baia dei Turchi, literally ‘bay of the Turks’. Most of the sandy beaches have free areas and private beaches where you have to pay around 20-35 per day for a couple of sunbeds and a beach umbrella. During summer these often offer the so-very-Italian, everyone-join-in exercise dance routines in the sea, which some kids will love. Although Puglia is edged by sandy stretches, there’s also a huge amount of fun to be had jumping off rocks into the sea along this coast. Polignano al Mare, a whitewashed town that gleams atop wind-sculpted sea cliffs, is famous as the site of the Red Bull Cliff Divingseries, an extraordinary annual spectacle in July with world-class divers. For leaps into the blue for the kids, there are other fantastic spots at Santa Cesarea alle Terme, San Gregorio, in the south, and, for a thrilling adrenaline rush, Grotta della Poesia, a turquoise sea pool into which you can jump from the natural bridge of rock at the water’s edge. Puglia may feel a long way from the savannah, but you’ll get a taste of it close to Fasano, a short trip from the major town of Bari. It’s part of a larger theme park, Fasanolandia (Adult/child €23/20; £21/£18.30), but the drive-through safari is the reason to visit. Children will get a thrill being so close to big cats roaming free, with giraffes bending down to peer through your car window and monkeys jumping on the bonnet. The warm seas of Puglia are a good place to try diving for the first time, and kids can sample underwater exploration via short taster courses at centres such as Scuba Diving Di Levanto Stefano at Otranto, or Orca Diving at Torre Lapillo. The training that participants receive will count some way towards a full diving certificate at a later date, or older kids and teens can go on to complete the full qualification. If your kids don’t fancy this, there is superb snorkelling all around the coast’s rock formations, and great visibility. Curious pointed houses dot the countryside around Puglia’s bucolic, hilly central region of Valle d’Itria. These are trulli, peculiar to the region. It’s thought they were built in this way as they were easily dismantled for tax purposes. The epicentre is at the town of Alberobello, where cone-shaped houses huddle together as if gathering for a gnome convention. Children will get a kick out of these fairytale looking places, and are also likely to love the town’s myriad souvenir shops. Best of all, you can arrange to stay in one of these curious, fairytale structures – many have been converted into holiday homes in the countryside around Alberobello and the other towns of the Valle d’Itria. Best for: children aged around four to 12 are most likely to get excited about these fantastical houses. You’ll find food and music festivals to enjoy throughout the year in Puglia, though most fall in July and August. Younger children may enjoy following the brass bands that parade around town centres, and they’ll love the hustle and bustle in Italian towns after dark: the chance to browse street stalls of toys and jewellery, and to have an evening gelato. If there’s no festival on, you’re guaranteed at least a passeggiatta, when everyone gets dressed up and strolls up and down the town centre, and kids are free to run about and play. During the Italian summer, children can stay up as late as they like. Bend your own family’s bedtime rules and join in. For details of festivals, enquire at local tourist offices.